Arctic Heat Technologies is a corporation established by local Alaskan Investors and the University of Alaska Anchorage. We use carbon fiber tapes (“Tundra Tape”) to heat outdoor surfaces (walkways, driveways, parking lots, roadways, etc.) to keep them free of snow and ice. Arctic Heat Technologies provides an innovative and cost-effective approach to revolutionizing snow removal and de-icing using carbon fiber Tundra Tape. 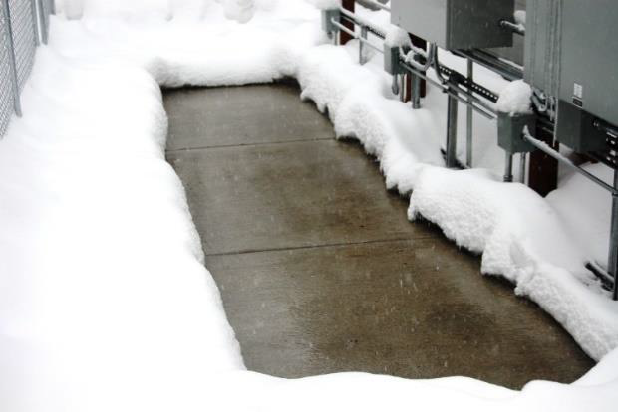 Efficient heating by the carbon fiber tapes embedded under concrete or asphalt keep the surface free of snow and ice. Arctic Heat Technologies' patent-pending innovation is embedding carbon fiber Tundra Tape under pavement to heat the surface. Carbon fiber materials, including regular carbon fiber and carbon nanofibers, exhibit unique strength and electrical properties, while offering enormous potential for snowmelt and de-icing applications. Taking advantage of the strength and low electrical resistivity, a plain woven, 3' wide carbon fiber tape is assembled into arrays for de-icing and preventing snow/ice accumulation. Single array sizes and shapes can vary up to 10'x10'. A nearly unlimited number of arrays can be controlled from a single controller. Bus bars are connected to the carbon fiber tape and a current is applied resulting in rapid heating. To ensure system safety, the heating arrays are coated with a thin but durable layer of thermally conductive, electrically isolative coating. Using a remotely accessible controller, the temperature of the heating array is limited to 30°C/86°F and the surface temperature kept below 10°C/50°F. Easy installation at lower costs - Complete installation costs 40% of a full Hydronic system. Significantly less expensive to operate than other systems. Cost of only $0.02 per ft2/day during the record heaviest snow fall winter in Anchorage. Self-monitoring and remotely managed - an iA3 controller manages the heating arrays based on the surface temperature, snow/ice detection, or remote command. Environmentally friendly - can be powered by renewable energy sources. Durable - carbon fiber tapes are high strength, non-reactive and feature long-term electrical stability. Versatile - easily customized to fit any shape. Alaska tested - successfully tested in Anchorage during the record snowfall winter of 2011-12. Tundra Tape keeping walkway free of snow and ice. de-icing technology for municipalities, departments of transportation, public buildings, private homes, and corporations. Arctic Heat Technologies (AHT) is a corporation established by local Alaskan Investors and the University of Alaska Anchorage (UAA). AHT uses carbon fiber tapes (“Tundra Tape”) to heat outdoor surfaces (walkways, driveways, parking lots, roadways, etc.) to keep them free of snow and ice. It has been successfully tested during the record snowfall winter of 2011/12 and currently installed and operating at two locations on the UAA campus. The company began in 2013 as CFT Solutions, LLC based on a patent awarded to Dr. Joey Yang, Professor of Engineering, and Associate Dean, at UAA. Dr. Yang now sits on the board of directors of AHT and acts as a technical advisor. In June of 2017, Arctic Heat Technologies, Inc was founded with the backing of Alaskan investors and UAA. A primary goal of AHT is to create local jobs and contribute to the economic development and diversification of the state of Alaska. Thank you for your interest in Tundra Tape and Arctic Heat Technologies, Inc.
We have received your information request and will get back to you as soon as possible.